Register Here Or Call 1-718-590-2965! All Participants Will Receive A Meal, Compensation, And A Health Resource Packet For Attending. You Must Be 18 Years Or Older, Comfortable With Speaking English, And A Bronx Resident/Worker/Caregiver In Order To Participate. 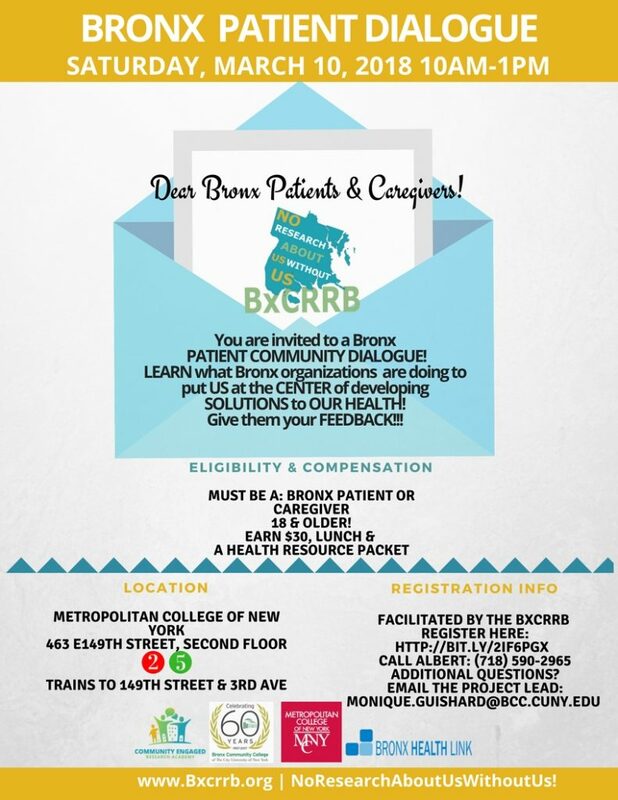 The Bronx Community Research Review Board (BxCRRB) advocates for Bronx residents by engaging researchers and communities, assuring culturally-appropriate research practices that are fair and ethical, and addressing health equity, well-being, and social and environmental justice. The BxCRRB educates its community about research opportunities and the benefits of participation, empowers its community to express their needs and concerns related to research, in order to increase the potential benefits of study to the community. The BxCRRB is committed to assuring research study results are appropriately disseminated to the community in order to increase trust between community and research partners and policymakers.